This bacon pancakes recipe is sweet and savory and so simple to make! Perfect for Sunday breakfast or stocking up for meal prep. This is our SEVENTH pancake recipe in the past couple of months on SPS and I think we might have saved the best for last! Because BACON! 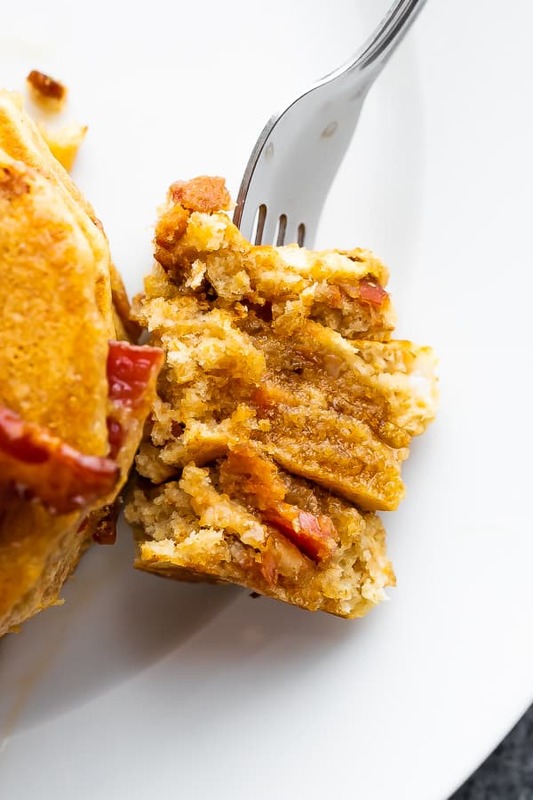 This bacon pancakes recipe is sweet and savory…and it is definitely a crowd pleaser. If you want, you can double or triple the recipe and save your leftovers for breakfasts through the week. These bacon pancakes keep well in the fridge or the freezer! First, you’re going to want to cook up your bacon! 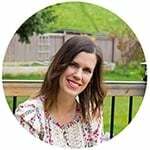 I used nitrate and sugar-free bacon from TruLocal, which is a Canadian company that connects you with high quality local meat. Use code DENISE7297 at checkout to save $25 on your first box! cool & chop up bacon. set aside. stir together all wet ingredients. Which kind of bacon works best in these pancakes? Any type of bacon will work well! You can use turkey bacon, maple bacon, whatever you’ve got! I loved using nitrate and sugar-free bacon from TruLocal. Can I swap the flour for XYZ? This recipe works with white whole wheat flour or regular all purpose flour. 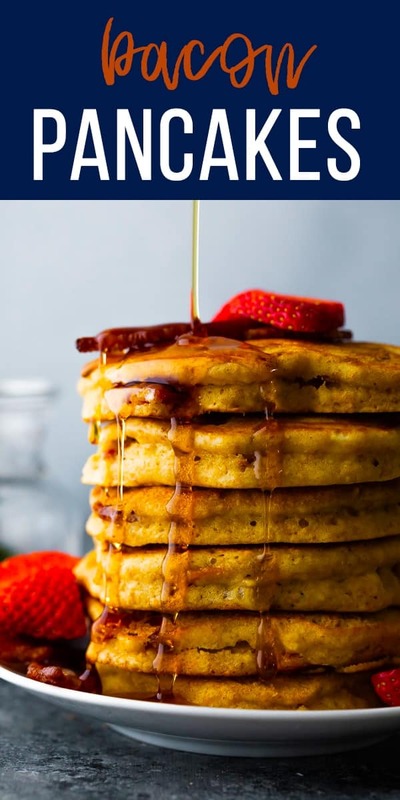 100% whole wheat flour ends up gummy in pancakes and almond flour does not work for this recipe. I have not tested gluten-free flour. 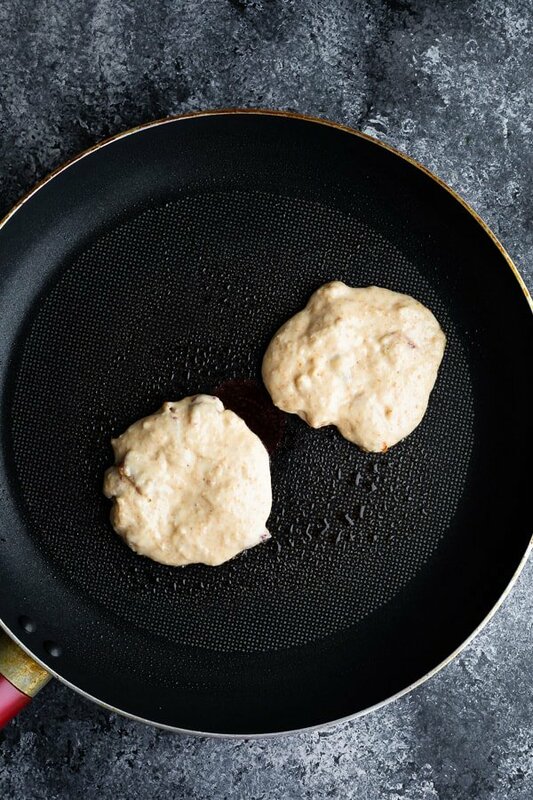 Can I make this bacon pancakes recipe ahead? Yes! We store them in meal prep containers in the fridge or freezer, then pop in the toaster when we’re ready to enjoy! 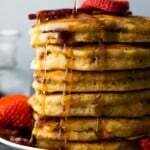 Which toppings go well with this bacon pancakes recipe? Maple syrup, fresh strawberries, and extra bacon. I used nitrate and sugar-free bacon from TruLocal, which is a Canadian company that connects you with high quality local meat. Use code DENISE7297 at checkout to save $25 on your first box! Looking for more pancakes? Check out these Fluffy Blueberry Pancakes, these Cottage Cheese Pancakes, or these Zucchini Chocolate Chip Pancakes! 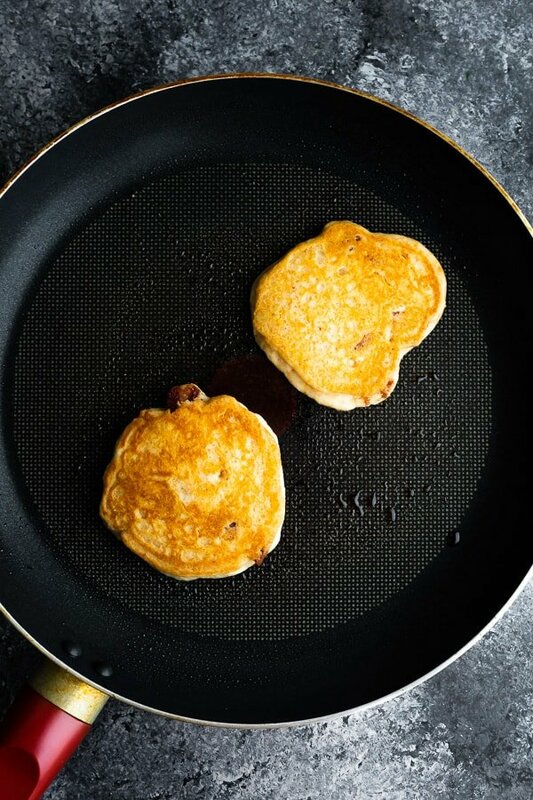 Cook bacon in the oven or in a skillet (reserve bacon grease from the skillet for pancakes. Cool & chop into small pieces. In a large microwave safe bowl, melt the coconut oil. Stir in the maple syrup, milk, vanilla and eggs. If coconut oil starts to re-solidify, pop it back into the microwave and warm on 20 second increments. Stir in the white whole wheat flour, baking powder and baking soda until *just* combined. Fold in the cooled & chopped bacon. Cook 1/4 cup portions in a greased non-stick skillet for roughly 2 minutes on the first side and 1 minute on the second side. 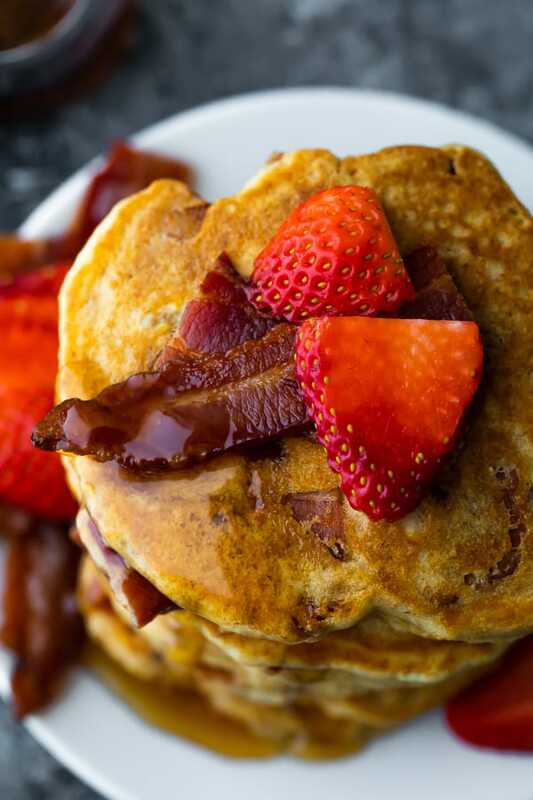 Enjoy with extra bacon, strawberries and maple syrup. 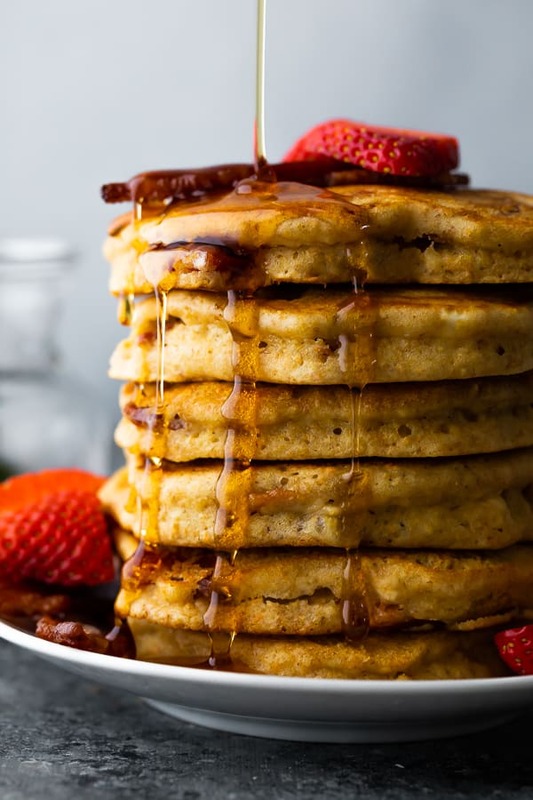 Pancakes may be prepared ahead and stored in an airtight container in the fridge for up to 4 days or freezer for up to 1 month. Reheat in the toaster or in a frying pan. This sounds like a great addition to add to my breakfast rotation! I was wondering though, how much raw bacon you used to get the 2 cups of cooked & chopped bacon? I wrote this down and now I can’t find my notes. I will report back when I find them!